Nagpur: In a significant action against the accused that attacked a 35-year-old man following a brawl over petrol near Golibar Square on Thursday night, Tehsil police have arrested Mayur Janardan Parate (28) resident of Tandapeth, near Lal Darwaja. 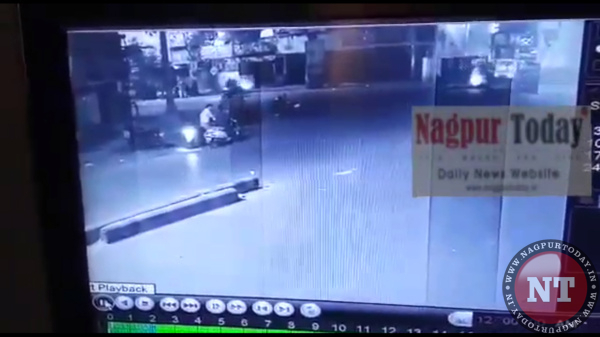 First it was anticipated that, accused were more than one regarding this connection as the CCTV footage rolling over the social media showed few more people around the crime scene. However when Nagpur Today contacted Police Inspector Vaibhav Jadhav, he revealed that there’s just one prime accused however others who appeared in the CCTV footage were trying to intervene regarding this incident. A resident of Pachpaoli, near Mahendra Nagar Ground, Deepak Rajesh Gour (35), was going on his vehicle around 10pm on Thursday. Midway, his vehicle’s petrol tank got emptied. As there was no petrol pump in the vicity, Deepak sought petrol from accused Mayur who worked at Samrat Paan Thela near Golibar Square, in Tehsil. However, since the accused Mayur refused to give petrol to Deepak, a heated argument erupted between them. Suddenly, the accused Mayur whipped out a knife and attacked Deepak on his head and hands with the intention of killing him. The profusely bleeding Deepak was taken to a hospital for treatment. After the attack, the accused Mayur fled the spot. Tehsil PSI V B Fartade based on a complaint lodged by Pritam Chudaman Bokde (29) of Pachpaoli, booked the accused Mayur Parate under Section 307 (Attempt to murder) of the IPC and launched further investigation.